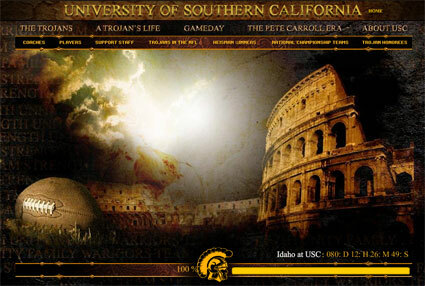 A new site… appears to be a USC Communications project. Fantastic use of lightning. Click here for the intro (video) and here to bypass the login. ….you know in ancient times the Trojans were gay? ….you know in ancient times the Trojans (spartans) were gay? so were the french and english italians and scandanavians, your point? Well, now we know what Mike is into. they need to keep this site up and running, its aesthetics are pleasing and its functional, while still showing the badass cardinal and gold past and present. big ups. In Greek mythology, the Trojans were from Troy and the Spartans were from Sparta. Sorry Mike, the Trojans and Spartans were from two different nations.